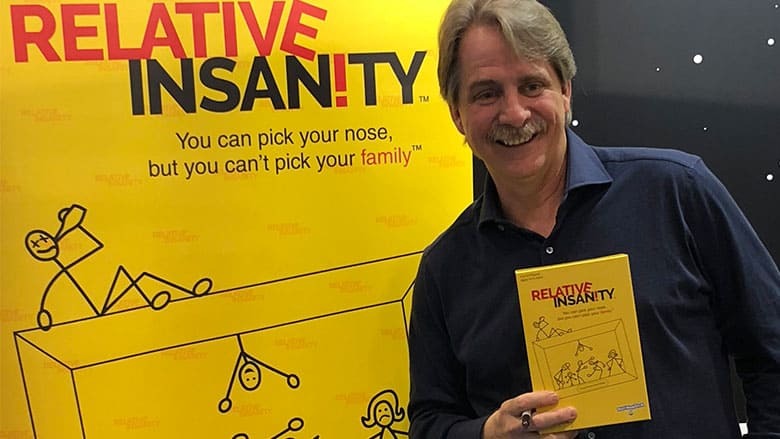 Relative Insanity: Jeff Foxworthy's New Party Game | Nerd Much? We’ve all always known comedian Jeff Foxworthy as a fun-loving guy, and it’s safe to say the man knows a thing or two about what’s funny. It’s for that reason that he teamed up with PlayMonster to create a new party game called Relative Insanity. The game is intended for ages 14 to adult, and is best played with 4 to 12 players. In Relative Insanity, one player will read a Setup Card aloud that says something like “When my brother brought out his new baby to show the family, Granny blurted out…” Then, all other players will look at their punchline cards in their hands that contain phrases like, “You’re not the father!” or “Somebody took a trip to the land of bad decisions” and various other statements of a similar nature, and pick the one that they think is funniest. These cards are played face-down so that the reader doesn’t see who played what card — that way, all decisions are based on the hilarity of the card, not the person who played it. The idea here is to use the funniest punchline card for each unique situation presented by the Setup Card, and if your card is chosen by the reader, you’ll earn a point, and you’ll keep the red setup card as your point. The official directions say to play until one player has earned five Setup Cards, but we played for much longer because we were having too much fun. But whether you win or lose is pretty much irrelevant here, as you’re just playing for the laughs — which there will be tons of while you’re playing. And, the fact that Relative Insanity can be played by up to 12 players makes it perfect for parties and family get-togethers. 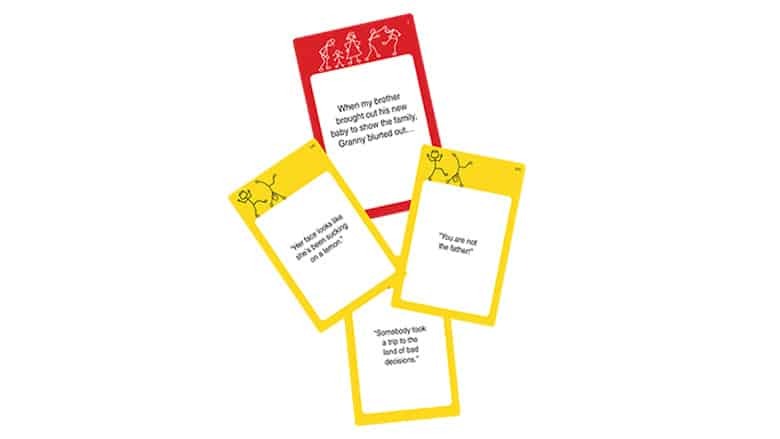 There are 100 setup cards and over 400 punchline cards, so there are plenty of different hilarious combinations possible every time you play. And, if you’re part of a big crazy family like I am, it makes the game even better. One thing worth noting is that the game uses relatable humor and doesn’t go for the shock value (which, if you know Jeff Foxworthy, you know that’s right on brand). So it’s relatively clean, family fun when compared to other family party games. 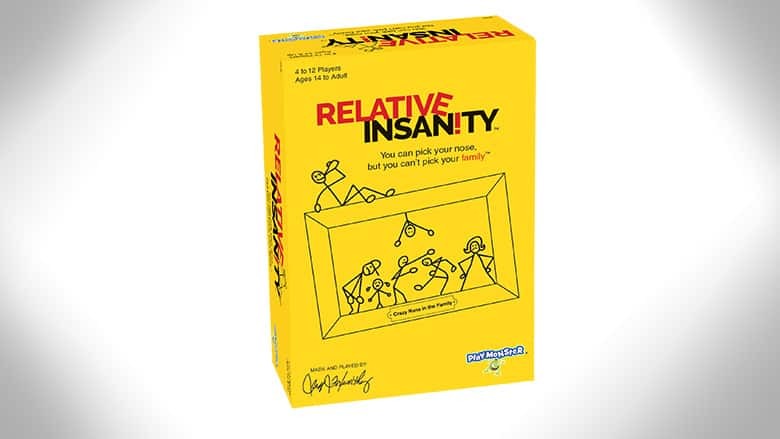 Relative Insanity is currently available at Walmart stores nationwide and online at Walmart.com.